A generation of Americans, artistic or otherwise, grew to adulthood with the notion that ‘When you wish upon a star / Makes no difference who you are’ singing in their minds and hearts. Perhaps such optimism is warranted in the world of animated crickets and marionettes that are transformed into boys of flesh and blood, but darker realities prevail in the unenchanted realms of mortal men and their societies. The ugly, exasperating, confounding truth is that in opera, as in most aspects of life, who you are makes a difference. That Marian Anderson was a woman of color made a difference when she requested use of DAR Constitution Hall for a concert in 1939. That Henriette Gottlieb, one of the most promising Brünnhildes of the interwar years, was Jewish made a difference when her voice was lost to the death chamber at Auschwitz rather than resounding in the Bayreuther Festspielhaus. What differences the circumstances of his upbringing in one of Berlin’s most affluent and influential Jewish families made when Jacob Liebmann Beer wished upon his star—l’étoile du nord, surely—are now difficult to ascertain, but the effects wrought upon the posthumous reputation of the composer he became, Giacomo Meyerbeer, are all too apparent. Even now, more than 150 years after the posthumous première of his final opera, L’Africaine, the enduring effects of the disapprobation of Richard Wagner and his disciples, a betrayal of Meyerbeer’s early endorsement of Wagner and his ideals that may have been fueled in part by antisemitism, and the wholesale suppression of the composer’s music by the Nazi regime shape the narrative of Meyerbeer’s artistic afterlife. With ERATO’s disc Grand Opera, a new star appears in the firmament of Meyerbeer’s fortune: German soprano Diana Damrau. One recording cannot make amends for a century-and-a-half of ignorance and aspersion, but wishing upon a star with Diana Damrau’s artistic luminosity cannot fail to brighten the future for Meyerbeer’s music. Born near the Prussian capital on 5 September 1791, three months to the day before the death of Mozart, Meyerbeer was, like his younger countryman Felix Mendelssohn, the son of a family of significant German Jewish artists and intellectuals. Unlike the childhoods of many celebrated composers, Meyerbeer’s youth was one of extraordinary privilege, his musical activities devoted to study of the piano under the tutelage of teachers including Muzio Clementi. Turning his attention to composition, Meyerbeer was a pupil of both Antonio Salieri and Abbé Vogler. Like Händel a century earlier, the young Meyerbeer endeavored to hone his gifts for vocal writing by immersing himself in the headwaters of the bel canto stream gradually broadening its floodplain to encompass all of Europe, arriving in Italy in 1816 and promptly making the acquaintance of his near-contemporary Rossini. Not unexpectedly, the German composer’s early Italian operas made liberal use of elements that endeared Rossini’s operas to audiences in Naples and Venice. By the time that Meyerbeer relocated to Paris a decade later, he was asserting his own unique voice, constructing upon the foundations built by Gluck, Grétry, Spontini, and Cherubini the monumental edifice of genuine French Grand Opera. On this disc, Diana Damrau retraces the course of Meyerbeer’s musical development, sampling operas representative of the composer’s evolution from imitator to innovator. Beginning her survey of Meyerbeer’s astonishingly diverse operatic landscapes with Berthe’s aria ‘Mon cœur s’élance et palpite’ from Le prophète, first performed in 1849, at the height of the composer’s fame, Damrau lays claim to music still associated in the minds of many opera lovers with the very different voice of Renata Scotto, by whom Berthe was sung in both John Dexter’s still-discussed Metropolitan Opera production in the 1976 – 1977 Season and the CBS Masterworks studio recording of the opera. When the Dexter production was revived in the 1979 – 1980 season, Prophète’s last outing at the MET to date, Berthe was sung by Rita Shane. In her performance of ‘Mon cœur s’élance et palpite’ on this disc, Damrau’s vocalism places her on middle ground between Scotto and Shane, her approach lighter than that of the former and her timbre darker than the latter’s. It is apparent from the first bars—and especially when the line first takes her above the stave—that Damrau is on good form, with commendably few suggestions here of the effortful tonal production and insecurity that have sometimes affected her singing since the births of her sons in 2010 and 2012. In this traversal of Berthe’s aria, the confidence that marked the soprano in the early years of her career as one of her generation’s finest singers resounds anew, the reliability of her ascents into her rounded, carefully-projected upper register largely unimpaired. She articulates French text with the intuition of an artist born on the left rather than the right bank of the Rhine, and she manages in four minutes to create an uncannily complete characterization of the tormented Berthe, an emotionally complex woman undone by a convoluted power struggle between civil authority and religious fanaticism. Only fitfully prefiguring Berthe in her vocal and dramatic demands, Isabelle in the masterful 1831 Robert le diable—refashioned for audiences beyond France’s borders as Roberto il diavolo—was another rôle in which Scotto made a lasting impression. Declaring her Isabelle’s trepidation to her beloved, tenor Charles Workman’s Robert, in an impassioned but eloquently-phrased reading of ‘Robert, toi que j’aime,’ Damrau touchingly evinces the character’s emotional turmoil whilst maintaining complete control over the vocal line. 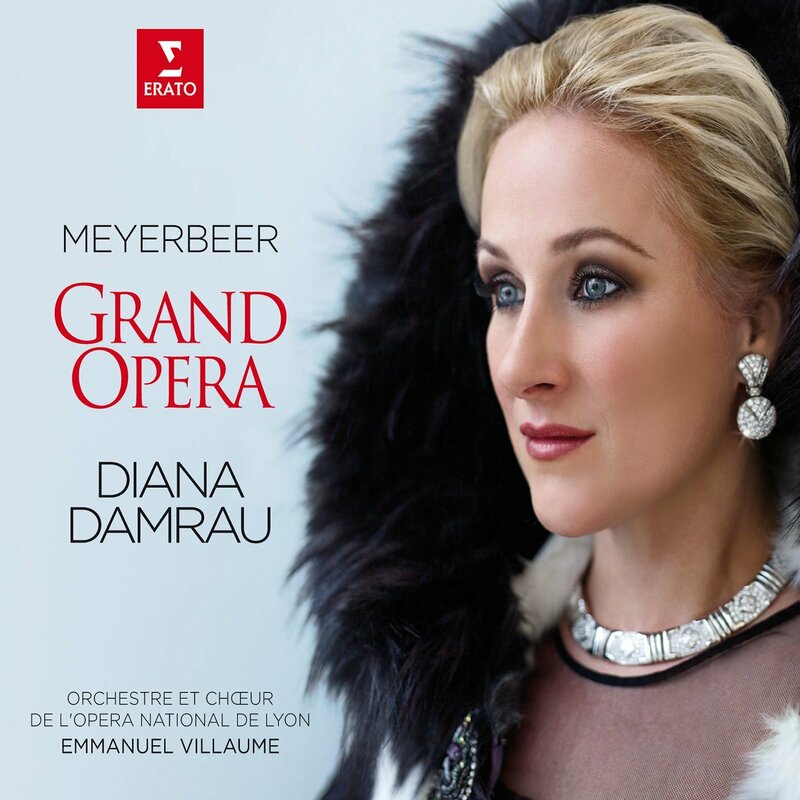 In this and all of the selections on Grand Opera, Damrau is elegantly aided in reaching musical and dramatic goals by the Orchestre et Chœur de l’Opéra national de Lyon and conductor Emmanuel Villaume. Much of this music was likely new to the Lyon musicians, but Meyerbeer’s stylistic spectrum is anything but foreign to them. Villaume conducted Damrau in Massenet’s Manon at the MET in March 2015, and the rapport honed in those performances persisted in the making of this disc a few months later. In his pacing of Meyerbeer’s music, the conductor supports Damrau instinctively, but the symphonic splendors of the composer’s orchestrations are not neglected. Alternately ebulliently Italianate, ruggedly Teutonic, and gracefully Gallic, the choral singing, orchestral playing, and conducting exhibit the same commitment to avoiding any semblances of business as usual that Damrau’s singing exudes. This emphatically is not assembly-line music making. In the two centuries since its unsuccessful première in Vienna in 1814, when the composer was still in his early twenties, Meyerbeer’s opera Alimelek, oder Die beiden Kalifen has been completely forgotten, a destiny instigated by Viennese audiences’ hostile reception of the opera, a reworking of Wirth und Gast, a score written for Stuttgart in 1813. Damrau makes her account of Irene’s aria ‘Nur in der Dämm’rung Stille’ a masterclass in the art of singing Rossinian bel canto, her German diction as conducive to placing vowels on the breath as her unaffected Italian. In a potent scene from the 1844 Singspiel Ein Feldlager in Schlesien, a score from which Meyerbeer later extracted material for reuse in L'étoile du nord, Damrau’s Therese interacts with the vibrancy of a staged performance with mezzo-soprano Kate Aldrich’s Vielka. The singers enliven the sisters’ lines in the recitative ‘Oh Schwester, find’ ich dich!’ by maintaining the naturalness of conversation. The sparkle of Damrau’s German in the Alimelek aria is complemented by the fluidity of her delivery of Therese’s aria ‘Lebe wohl, geliebte Schwester.’ The first Therese, Karlsruhe-born soprano Pauline Marx, was respected on the Continent for her portrayals of Donna Elvira in Mozart’s Don Giovanni, the heroines in Bellini’s Norma, La sonnambula and I puritani, Abigaille in Verdi’s Nabucco, and even Ortrud and Venus in Wagner’s Lohengrin and Tannhäuser. Otto Nicolai composed the rôle of Frau Reich in Die lustigen Weiber von Windsor for her, and, in addition to Theresa, her Meyerbeer repertory consisted of Fidès in Le prophète, Alice in Robert le diable, and Valentine in Les Huguenots. Marx’s voice was clearly an uncommonly versatile instrument, perhaps a competitor for the singular voice of Cornélie Falcon, for whom Meyerbeer wrote Valentine in Les Huguenots. The question of whether any current or past singers are or were heirs to Falcon’s mantle invariably prompts some of opera’s most heated debates. Damrau is unlikely to ever be seriously proposed as a legitimate Falcon, but the increasing fullness of her lower register and the authority with which she negotiates the tessitura of ‘Lebe wohl, geliebte Schwester’ elicit fascinating speculation about future paths in Damrau’s judicious choices of repertory. Though successfully staged at London’s Camden Festival in 1975 and at Ireland’s Wexford Festival twenty-one years later, L’étoile du nord has not regained the acclaim that greeted its 1854 première. The opera’s libretto is a liability for modern productions, but the score is among Meyerbeer’s most appealing. Damrau voices Catherine’s recitative ‘Ah, mon Dieu!’ with unbreakable focus, establishing an atmosphere in which her tonal colorations shimmer. Accompanied by the hypnotic playing of flautists Julien Beaudiment and Catherine Puertolas, she lofts the sensual line of ‘C’est bien l’air que chaque matin’ with sounds that evoke the refreshing air of which she sings. L’Africaine, first christened by its creator as Vasco da Gama, did not reach the stage until 28 April 1865, four days short of the first anniversary of Meyerbeer’s death. In the Twentieth and Twenty-First Centuries, L’Africaine has clung to a tenuous place on the fringe of the international repertory, contributing invaluably to the slow rehabilitation of its composer’s reputation. The ruminative depictions of L’Africaine’s dual heroines, Sélika and Inès, are among the most admirable accomplishments of Meyerbeer’s career. The focus on making beautiful sounds that heighten the emotional reverberations of the words gives Damrau’s performance of Inès’s recitative ‘Là-bas, sous l’arbre noir’ and aria ‘Fleurs nouvelles, arbres nouveaux’ a directness that transcends typical operatic artifice. Joined by Aldrich as Inès’s confidante Anna, Damrau makes ‘Anna, qu’entends-je’ a genuine discourse. Her poised ‘Adieu, mon doux rivage’ is Grand Opera’s sentimental dénouement: implicitly trusting the lucidity of Meyerbeer’s word setting, Damrau allows the music to communicate its allure to the listener rather than encumbering it with unnecessary contrivance. It was with Il crociato in Egitto, first performed at Venice’s storied Teatro La Fenice in 1824 and notable for being one of the latest scores by a major composer to feature secco recitatives and a leading rôle written for a castrato, that Meyerbeer expanded his fame over all of the European continent. Recorded in studio by Opera Rara and in performance at La Fenice by Naxos, Il crociato in Egitto has a more robust presence on disc than many of Meyerbeer’s operas, but this hardly equates with familiarity. Her Palmide contending with bass Laurent Naouri’s Aladino in the rousing ‘D’una madre disperata,’ Damrau unleashes a thunderous display of temperament, tellingly contrasted with her limpid, urbane singing of ‘Con qual gioia.’ An example of the melodramma eroico genre popular in Italy in the first quarter of the Nineteenth Century, Emma di Resburgo enjoyed a phenomenal success at its 1819 première in Venice’s Teatro San Benedetto, its first run extending to more than seventy performances and leading not only to productions in other cities but the publication of the score, making it the first of Meyerbeer’s scores to appear in print. Already largely forgotten by the time of Meyerbeer’s death, Emma di Resburgo was likely unheard for 150 years until a 2010 concert performance in Vienna. Damrau’s performances of Emma’s recitative ‘Sulla rupe triste, sola’ and aria ‘Ah questo bacio’ reveal this to be music equivalent in quality to the best of Rossini’s contemporaneous work. [Two months prior to the première of Emma di Resburgo, Meyerbeer’s first Emma, Italian soprano Rosa Morandi, created the rôle of Cristina in Rossini’s now-forgotten Eduardo e Cristina, also at the Teatro San Benedetto.] Damrau’s bravura technique remains one of the wonders of the operatic world, but she separates herself from the ranks of singers with similar repertoires by pinpointing the dramatic purposes of coloratura cyclones. Despite being the source of an aria intermittently popular as a concert piece for coloratura sopranos, 1859’s Le pardon de Ploërmel—more commonly known under the name of its goat-loving heroine, Dinorah—until recently shared Il crociato in Egitto’s fate of being available on compact disc in note-complete form only in an Opera Rara recording, a rumored studio recording with Sumi Jo never having materialized. Though singers as renowned as Luisa Tetrazzini and Amelita Galli-Curci espoused Dinorah, few sopranos active after the early decades of the Twentieth Century have explored the score beyond the famous aria ‘Ombre légère.’ Delivering the prefatory ‘Comme cette nuit est lente à se dissiper!’ with elocution worthy of another operatic heroine, Adrienne Lécouvreur, Damrau discloses psychological depth in the strains of ‘Ombre légère’ that most coloratura songbirds have failed to perceive. Damrau’s sopracuti now lack some of the freedom that they possessed in seasons past, but their impact is enhanced by the interpretive insight with which they are deployed. It is almost exclusively to Les Huguenot, his epic and still grippingly topical 1836 tale of religious strife in Sixteenth-Century France, that what recognition Meyerbeer enjoys among most opera lovers is owed, thanks in no small part to Dame Joan Sutherland’s performances and studio recording of the opera. It was not without justification that Les Huguenots was described in the 1890s, when Lillian Nordica appeared as the opera’s regal heroine Marguerite de Valois in performances at the Metropolitan Opera, as the ‘night of seven stars’: only a constellation of great singers can present the mammoth score with the grandeur with which the composer infused the music. Backed by the Urbain and Coryphée of sopranos Pei Min Yu and Pascale Obrecht and the Dame d’honneur of mezzo-soprano Joanna Curelaru, Damrau brings to Marguerite’s well-known ‘Ô beau pays de la Touraine’ a voice likely resembling that of Belgian soprano Julie Dorus-Gras, by whom the rôle was first sung, more than either Nordica’s or Sutherland’s. Though compromised by sporadically faltering intonation, Damrau’s performance is in some ways revelatory, not least in the emphasis on extending the melodic line across the long spans desired by the composer. The soprano’s breath control enables her to achieve niceties of phrasing that many singers can only approximate through trickery. In the aria’s cadenza, here bizarrely reminiscent of the Air des clochettes in Act Two of Delibes’s Lakmé, Damrau resolves phrases uncertainly, movingly depicting the enmity that upends Marguerite’s tranquility. The trills in the de facto cabaletta, ‘Sous mon empire on ne respire,’ are crisply executed, and the expected interpolated top D is hurled out bravely. It has been widely reported that Damrau is slated to sing Marguerite opposite Bryan Hymel’s Raoul de Nangis at Opéra de Paris in a future season: her performance of ‘Ô beau pays de la Touraine,’ a sizeable portion of Marguerite’s music, on this disc shows her well on her way to conquering the rôle. In her ‘personal and heartfelt preface’ to Grand Opera, Diana Damrau wrote that recording a disc of arias by Giacomo Meyerbeer was an ambition that formed during her studies, when she was discovering the magnificent variety of music available to a young artist with her incredible capabilities. With funding for the Performing Arts so dishearteningly imperiled, few of today’s singers are granted opportunities to bring their recording ambitions to fruition. In those rare instances in which artists’ goals and record labels’ resources intersect, those singers whose aspirations are denied are owed the recompense of the recordings that reach listeners wholly deserving that luxury. In the case of Grand Opera, both recording and hearing the disc are undertakings that are lavishly rewarded. Disney’s Jiminy Cricket also sings—with regrettable grammar—in ‘When You Wish Upon a Star’ that ‘when a star is born, they possess a gift or two. One of them is this: they have the power to make a wish come true.’ In fact, with Grand Opera Diana Damrau makes two wishes come true: her own and that of listeners eager to understand why Giacomo Meyerbeer dominated opera in the Nineteenth Century to an extent rivaled only by Verdi and Wagner.